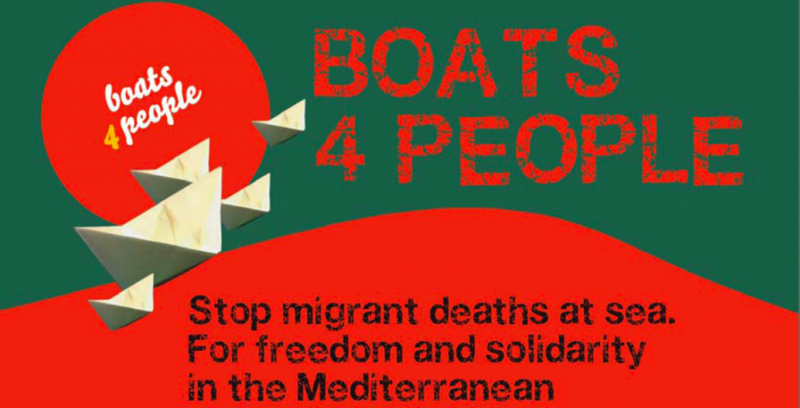 Boats 4 People is an international coalition of organizations from the Mediterranean, Africa and Europe, established in 2012 to end deaths at maritime borders and to defend migrants’ rights at sea. They advocate freedom of movement for all. Kaddafi and Ben Ali may have been overthrown, but so far, the transitional authorities in Libya and Tunisia have not broken with past migration policy. On the contrary, migration agreements are already being concluded with the EU and member states without transparency and emigration continues to be criminalised and migrants in transit continue to be arbitrarily detained. Military boats intercept migrants off the Tunisian and Libyan coasts with the consent of European authorities and camps such as the refugee camp in Choucha, Tunisia are now being used to detain migrants intercepted at sea. Migrants in the Choucha camp and in Italian detention centres are protesting against violations of their rights. Families of missing Tunisian migrants have organized sit-ins in Tunisia and Italy to demand information on the whereabouts of their loved ones. European and African governments continue to violate international agreements concerning unconditional rescue at sea, asylum and international protection, with almost complete impunity. – Governments of Africa to break with the past and to refuse to sign readmission agreements with European countries and the EU, as these agreements result in violations of migrants’ human rights. – All countries to stop prosecuting those who rescue migrants, in accordance with the law of the sea under which all sailors must “proceed with all possible speed to the rescue of persons in distress” (art. 98 of the United Nations Conventions on the Law of the Sea). – Mobilize people in the Mediterranean, Africa and European so that the Mediterranean becomes a place of solidarity and ceases to be a mass grave for migrants.